Thanks to the wonderful cover designs by Debra Dixon, all three of the Journals of Myrth books managed to make their way into the position of finalists in the EPIC Ariana Cover Awards for Children's/YA Fiction. In 2012, the Electronic Publishing Industry Coalition chose How to Slay a Dragon for the 1st Place award. Hooray, Debra! Thanks to Pearl Ollie and all the great people at Channel 49 in Brevard, the world was able to hear Bill Allen speak about his first book in the Journals of Myrth series. Those who managed to stay awake through the experience should be commended, but I think all would agree that Bill should probably stick to writing down his thoughts. I consider myself very fortunate to have met Debra Dixon, a woman who enjoys helping new writers get their start. 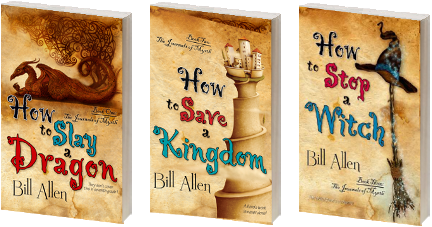 She takes a very hands-on approach to publishing and gave me personal advice on how to improve what was originally my Greg Hart Trilogy, creating three magnificent book covers and preparing this trailer for my first book in the Journals of Myrth series. What can I say? The woman does it all! You enjoyed the Harry Potter series and other similar book series.